1 A Study of Colour in Chinese Enamel. 20 B. 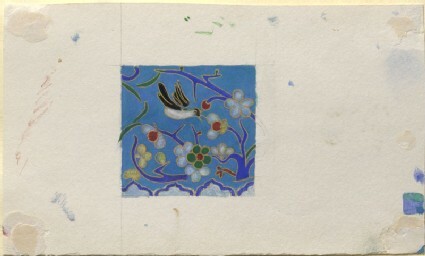 Study of Chinese enamel. The Oriental colour is more subtle than the Gothic; but the want of power over form indicates total inferiority of intellect and general art capacity. Compare the bird, here, with the perfect though quaint delineation of the Egyptians (13). This example may serve to remind you of the general principle for good colour which is stated in my Elements of Drawing:Make the white precious, and the black conspicuous.